Good morning! 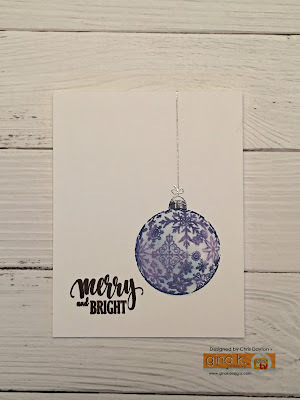 Welcome to the Merry & Bright StampTV Kit Inspiration Blog Hop! 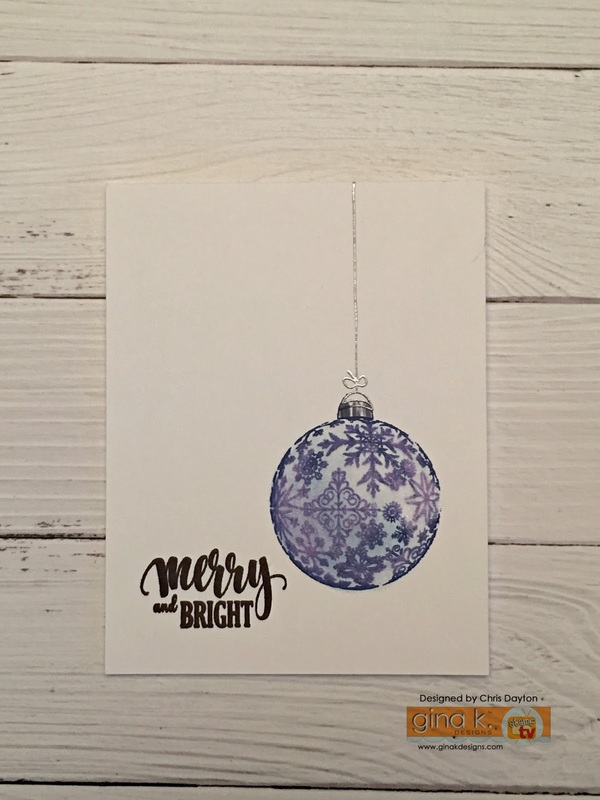 Today and tomorrow, Gina and the Gina K Designs team are sharing inspiration projects featuring the amazing new holiday kit, Merry & Bright. 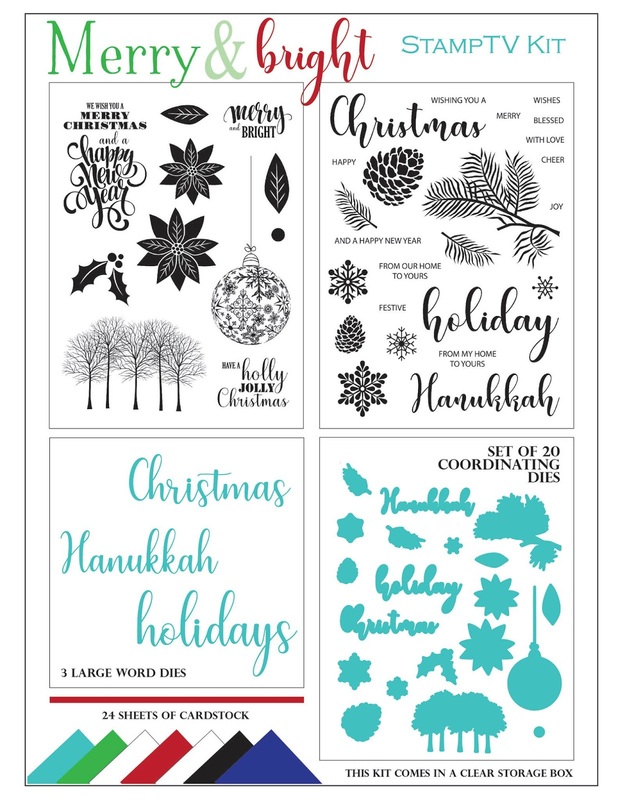 Gina has assembled a beautiful collection of images, both a open and silhouette, papers and lots of dies, giving everyone tons of options for their holiday cardmaking, tags and gift projects. This is such a fantastic loaded kit! The retail price of all the elements included is well over double the price of the kit. 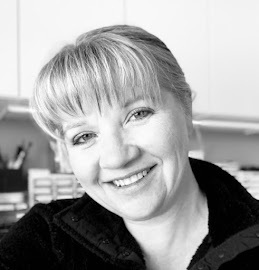 Enjoy the gorgeous inspiration samples from the team today and be sure to comment on each blog for your chance to win a $50 Gina K Designs gift certificate! 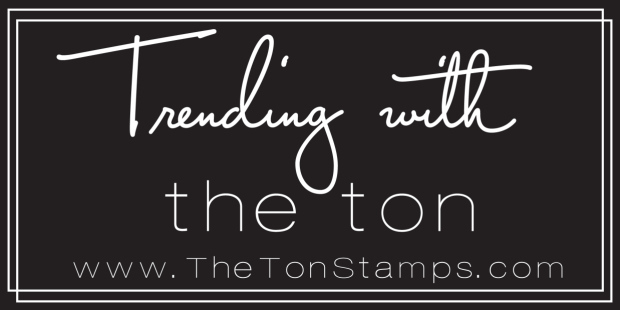 To see who won, check the Big News Forum at StampTV a few days after the hop. 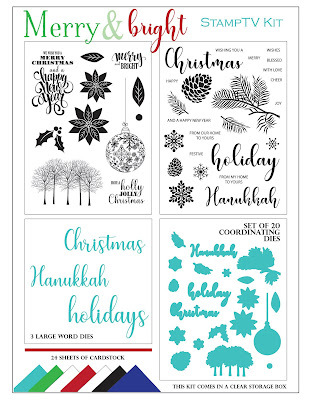 Today I am sharing three projects using stamps from this kit. One of the most stunning images included in the kit is this gorgeous ornament. I used it to make a simple one layer card. I stamped the ornament using my MISTI. I partially inked the image, using Blue Denim ink only on the circle of the ornament. I used a Post-It note to mask the ornament, then I used second generation Moonlit Fog ink, stamping off first on a piece of scratch paper before stamping the cap and hook of the ornament. Leaving my ornament stamp in my MISTI, I removed my card, and colored my ornament with Copic markers. I used lavender and pale blues for the ball, and cool grays to create a metallic cap. I also added Spectrum Sparkle pen to the ornament. 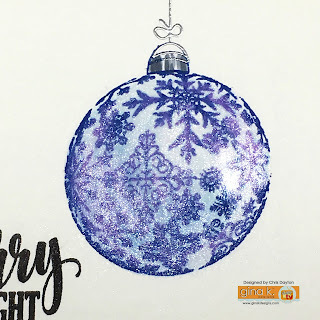 Once my card was fully dry, I placed it back into my MISTI and used Versamark ink and silver embossing powder to add the string to the ornament. The Merry & Bright greeting was added with Black Onyx ink. This is another clean and simple card using the holly image. I used a small sponge dauber to apple the ink to my stamps bit by bit, using my MISTI to stamp and restamp multiple times. I began by adding Jellybean Green to the tips of the holly leaves, each time I stamped, I added a bit more ink, darkening the images as I moved toward the berries. I moved to Grass Green ink toward the middle of the leaves, and Fresh Asparagus at the base. I used Red Velvet ink on the berries, with a tiny bit of Cherry Red at the bottom of each berry. 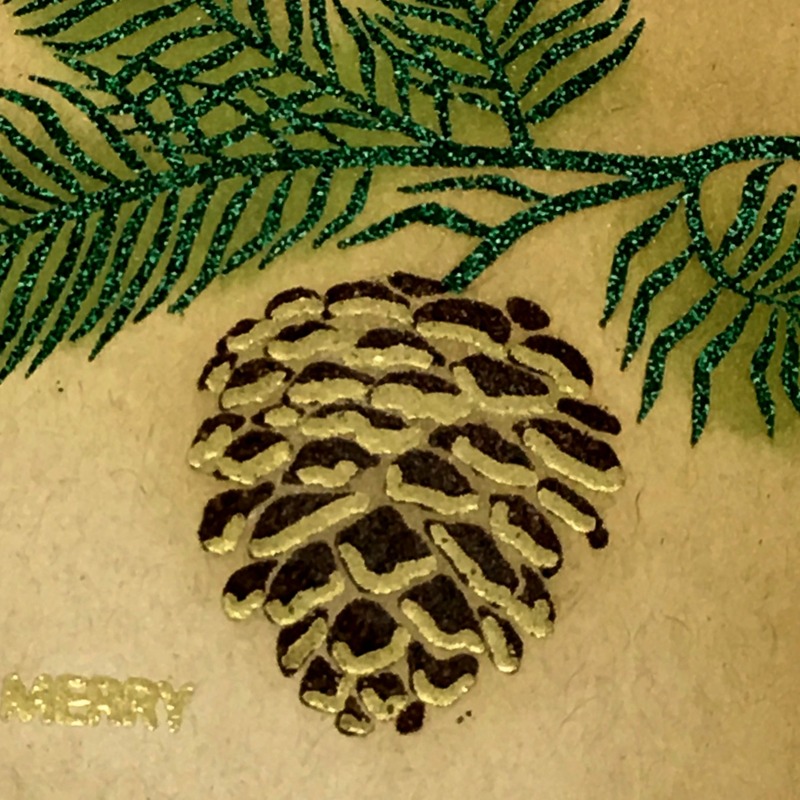 I heat embossed the greeting with gold embossing powder and added a strip of foiled paper and Morning Dew Nuvo drops to give dimension to the berries. 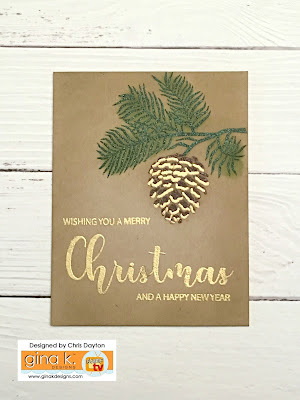 I used another of the large kit images to create this second one layer card, I stamped the pine branch on my Kraft card base with Versamark ink and embossed with Christmas Pine embossing powder. The pine cone was added with Charcoal brown ink. I used sponge daubers and Grass Green and Kraft inks to add a bit of extra color to the images as well as the edges of the card. The greeting was assembled using a few of the many mix and match greeting stamps and stamped with Versamark and embossed in gold. 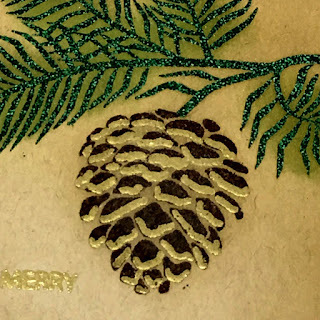 I also used a Versamark marker to add ink to the pinecone so I could add gold embossing to the edges of the pinecone scales. Gorgeous Christmas ball ornament! All beautiful cards. I am a real fan of clean and simple and your cards are perfect. Your cards are fabulous. I love the clean crisp feel of them. The second one is my favorite. Love the way you did the sprig of pine. Love the simplicity of the cards. Thanks for sharing your talents with us. I love your cards! The ornament was one of the first things things that drew me to this kit too! And I also love how you did the pinecone! Awesome. I love how you did the ornament. The holly is beautiful, as is the card with the pinecone. Thanks so much for including the wonderful details and all the wonderful inspiration. 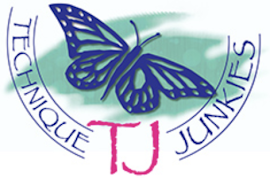 Love the cards.- Am getting my kit in the mail today and can't wait to use it! Oh my goodness — these are all so gorgeous! I especially love the last one with the gold embossing on the pine cone. Thanks for the detailed descriptions of how you made each one. such a great variety-thanks for sharing your creative talents with us! ll are just beautiful, and I especially love how you did that ornament!!! Awesome. These cards are beautiful. The ornament and the way you did the pinecone are fantastic. I also appreciate your directions on how to do the pinecone. I love the golden pine cone! Your cards are always beautiful and make me want to be like you. Love love love these cards!!! They are gorgeous, yet simple!! Definitely pulling my kit out today to create!! Thanks for sharing!! Big Hugs!! Love what you did with the ornament - it's gorgeous! You made something simple look extravagant. Nice job...thanks for inspiring me!! Oh my gosh that ornament is just gorgeous. Beautiful blues. Wow! LOVE your cards!! Especially the pine cone one. Wow! Love your cards! Thanks for sharing! What beautiful cards! Not sure which is my favorite. All have amazing touches!!!! These cards are gorgeous. I am going to give thsee a try. So pretty. Such beautiful simplicity with the designs you made. I really love them. Beautiful cards, love the sparkle on your pine bough! Chris, love your cards! Thanks for sharing. Your cards are full of inspiration! Thanks for all the technique explanations. I love all your cards! These cards are just beautiful! I love the pretty blue and white ornament - it looks like porcelain! Really beautiful! Wow! I love how you put gold on the pinecone edges! Your cards are beautiful! I especially like the ornament one. Wow! All beautiful and I love that ornament stamp. It is wonderful. Also liked how you embossed your pine cone. Clean, simple but stunning cards! FANTASTIC! I love the size of that ornament, and not just that, but the coloring on it makes this the most beautiful ornament I've ever seen, not just in the stamping, but also the coloring. Also, so very creatively beautiful is the gold on the cone. I love your blue ornament card! It is just stunning! Thanks for sharing and giving us inspiration! Beautifully done! Thanks for the idea of putting gold apron the tips of the Pinecones. Gorgeous cards...love that pine cone! Now those are my kind of cards...CAS yet elegant!! I had my eyes on that ornament on your first card when I saw the kit! 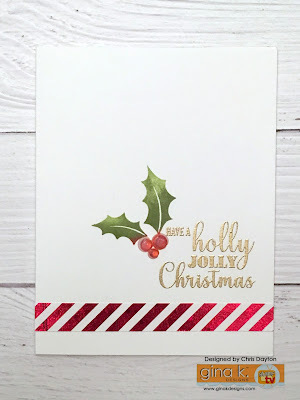 Just love the embossing & glitter on all of them!! I love the CAS ornament card and the gold embossing adds such an elegant look on the other cards! Beautiful cards and love the pinecone and branch card. With each click of my mouse all I could say was "ooh, ah, my goodness", your cards are just beautiful. What a delightful presentation. Thanks for sharing and inspiring! All three cards are so beautiful...love all of the different techniques you used to make each...very clever and wonderful card designs. The inking and gold on the pine card are so pretty with the gold sentiment. WOW, stunning, especially the ornament card, so gorgeous! Chris, you have done an amazing set of examples for this card kit. Love the glitter pine needles. Thank you for sharing. Beautiful cards. I especially love the pinecone card. These are really great cards. So pretty and will go through the mail well. Beautiful cards! I really love that gorgeous ornament! Very pretty! Clean and simple is best. Stunning CAS creations - love them all!!! I love your set of CAS Christmas spirit cards ! The pine cone is my favorite. Beautiful cards! So sparkly and festive! You clear and simple design with added details is very inspirational. i love how you did the ornament!.. awesome! 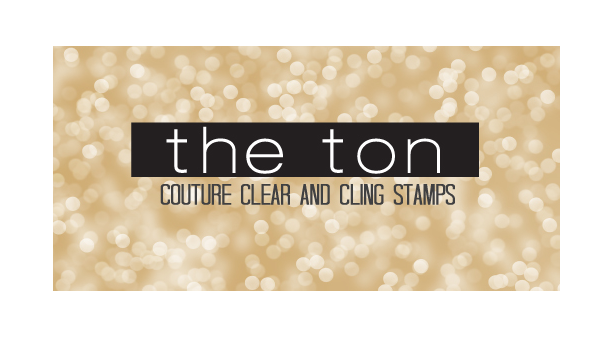 Lovely cards - love the gold embossing. Great cards. I love the blue ornament - still don't understand quite how it was done - but it is beautiful. These are my kind of cards. Clean, simple and gorgeous! Oh, my! Such clean, simple and stunning cards. Love them all! Beautiful details and I love all the open area. Those are my favorite kind of cards. Wow! Beautiful cards!!! They're so festive!!! Love all the glitter, beautiful cards. Love your cards! The ornament is beautiful! It is great to see more one layer card ideas. Simple and elegant. I love all three of these incredible cards. Love the CAS designs! The ornament is beautiful! Thanks for sharing your creativity! Very pretty CAS cards. Every now and then, we all need a CAS card. Your ornament looks so real! It's amazing and that pinecone, beautiful. Love the simplicity of your cards. Less is more.